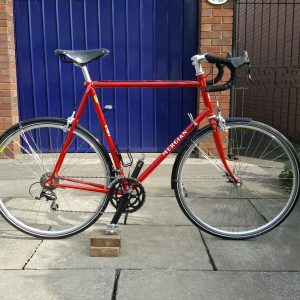 On the 4 May last I collected my 2nd custom built frame from you – An Audax Special. This is to complement my earlier custom build – A King of Mercia, completed Spring 2013. 2013 King of Mercia 64.5cm (Dry weather Mercian). Hope Headset. 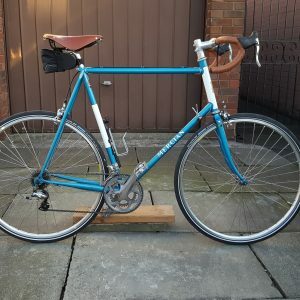 Shimano 105 Hubs, Compact Chainset & F&R mechs, Cassette. KMX chain. Ritchey Classic Handlebar & Stem. Shimano Dura Ace down tube shifters and brakes with Cane creek levers. Brooks Saddle. Mavic Open Pro rims with Continental 28mm Gatorskin tyres. MKS Touring pedals. Blackburn bottle cage. The picture of the 2013 King of Mercia shows Schwalbe Duranos. At the present time it is fitted with Contis as per the spec. Hope Headset & Hubs. Shimano 105 Compact chainset & F&R mechs with Dura Ace cassette. KMX chain. Dura Ace down tube shifters. Nitto handlebar, stem & seat pillar. Brooks saddle. Shimano 650 deep drop brakes with Cane Creek levers. Mavic Open Pro rims with Schwalbe Durano DD 28mm tyres. MKS touring pedals. Blackburn bottle cage. SKS Mudguards.